After turmoil in the United States and Asia, stock markets in Europe managed to find a steadier footing Friday. Major indexes across the continent opened lower, but the losses were relatively modest. London's FTSE 100 was down 1%, and Germany's DAX shed 1.6%. Dow futures were showing losses of about 150 points, or 0.7%. Things were a lot uglier in Asia, where stocks dropped roughly 2% in Tokyo, 3% in Hong Kong and 4% in Shanghai. The trouble in Asian markets followed more grim news from Wall Street. The Dow closed down 4.1% Thursday after another volatile trading session. 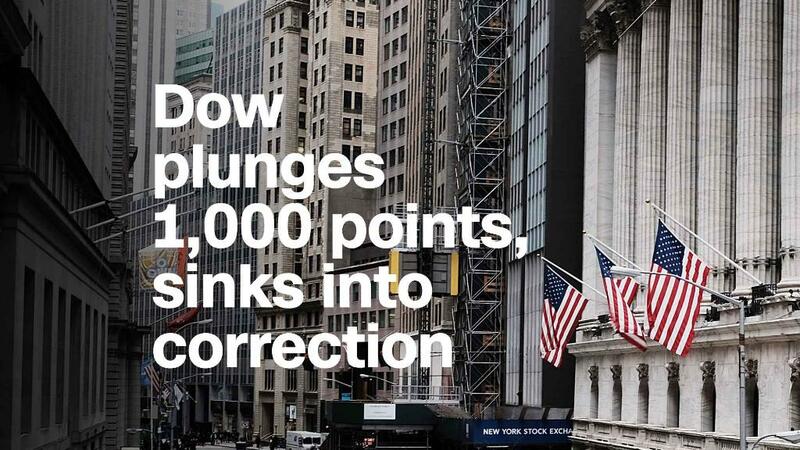 It was the second time in history that the Dow has lost more than 1,000 points in a single day. The other time was Monday. The losses in Asian markets Friday capped a brutal week. The Nikkei is now down more than 11% from its peak in late January. That means that like the Dow and some European markets, it's in correction territory -- a decline of 10% or more from a recent high. Experts generally agree that the U.S. and other major economies are in good shape. But investors are worried about inflation and the possibility that the U.S. Federal Reserve will hike interest rates faster than previously anticipated in order to rein it in. The Bank of England said Thursday that it could increase rates more quickly than expected because of a booming global economy and rising domestic prices. U.S. government bonds are one key indicator to watch. The yield on 10-year U.S. Treasuries hit a four-year high on Thursday, suggesting more fears of rising inflation. If yields stay high, they will continue to set a "pessimistic tone" for Asian markets, said Jingyi Pan, a market strategist at stock broker IG Group. JPMorgan Asset Management's chief market strategist Tai Hui said investors were focusing on U.S. inflation data due next week for clues on what to do next. "A stable number will reassure markets," he said, but any new signs that inflation is picking up steam could roil them again. The gloom was particularly heavy in Shanghai on Friday. Hui attributed the selling to "Chinese investors wanting to cash out" before next week's Lunar New Year holiday. China's currency has also come under pressure. The yuan has shed about 1.2% of its value versus the U.S. dollar over the past couple of days. Tommy Xie, an economist at OCBC Bank, said the yuan's decline was mainly triggered by a surprise narrowing in China's trade surplus in January. Government data published Thursday showed imports surged 37% from a year earlier. A shrinking trade surplus suggests less demand for a country's currency, which can cause it to weaken. The drop has ended a broad rally for the Chinese currency against the dollar in recent months. -- Charles Riley, Jethro Mullen and Matt Egan contributed to this report.